Sitting in the snow banks of the Mistaya River is a pair of snowshoes. To enjoy the winter recreation opportunities, hikers use snowshoes to distribute their weight to help walk on the snow instead of sinking into it. A pair of modern snowshoes sit in the snow banks of the Mistaya River. The wonderful backdrop to the snowshoes is the snow covered valley of Mistaya River and Mount Sarbach. To make hiking easier in the snow, hikers use snowshoes to distribute a person's weight to help walk on the snow instead of sinking into it. Snowshoes were originally made of hard wood and rawhide lacing. The ones pictured are a more modern snowshoe made of plastic, metal and synthetic fabric. Snowshoeing has become a popular form of winter recreation. recreation, next to the Mistaya River. Pictures from photo gallery "Snow Shoeing"
This picture is part of the photo album "Snow Shoeing" - there are more beautiful images waiting for you. The stunning snow covered Mount Sarbach is part of the Canadian Rocky Mountains and is named after Peter Sarbach a mountain guide from Switzerland. 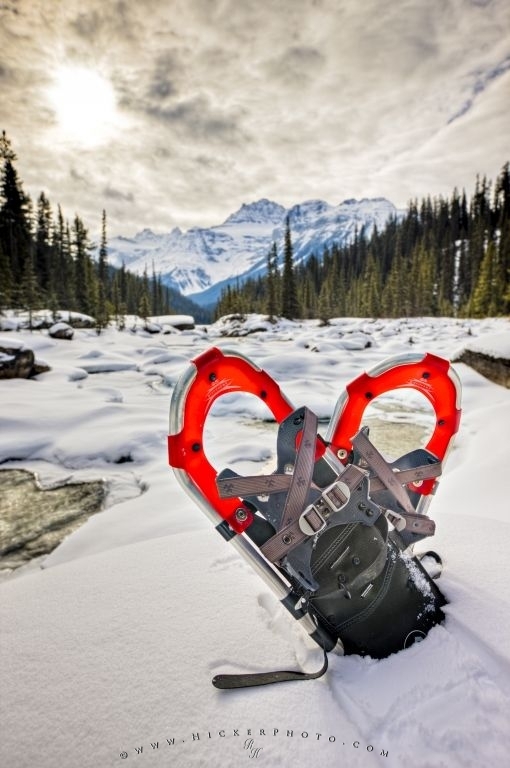 Snowshoes in snow on the banks of the Mistaya River during winter with Mount Sarbach (3155 metres/10351 feet) in the background, Mistaya Canyon, Icefields Parkway, Banff National Park, Canadian Rocky Mountains, Alberta, Canada. Banff National Park forms part of the Canadian Rocky Mountain Parks UNESCO World Heritage Site. I photographed this photo with the digital SLR camera model Canon EOS-1Ds Mark III, aperture of f/6.4, exposure time of sec. on ISO 50, as always I used a original Canon Lens, the focus lenght for this picture was 23mm.